What companies/products has Claudio had a hand in over years? With Synergy right around the corner, what do you expect? How does VMware’s moves with JIT and AppVolumes make Claudio feel about VMware? Thoughts Thoughts does Claudio have on Dell’s announcement on vWorkspace? What are Claudio’s thoughts on other players in the market? Does Claudio see someone like Parallels gaining more traction? What are Claudio’s thoughts on Microsoft’s approach to the EUC space? 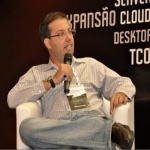 Does Claudio expect DaaS this year in Azure? Raspberry Pi is getting all the buzz as thin clients, what’s Claudio’s take on them? What does Claudio think is missing in the EUC space? Where does it need to go next? What’s on the horizon for Claudio? On a personal note, away from EUC what technology does Claudio enjoy? Windows continues to exhibit security errors and are often not fixed as quickly as Linux. However, while Linux for the Pi may not be ideal, either, at this point, regardless, some platform is perfectly capable of hosting a basic Receiver and the means to support USB peripherals and a minimal number of other things. Long-term it doesn’t matter what it it. And there will be other SoC units that can and will provide the same functionality. So, IMO, the RPI is perfectly viable and way less expensive than similar commercial units that cost many times as much and offer the same performance. That concept of a cheap, easily replaced thin client is what makes the Pi exciting; it’s the first of what I think will be a string of similar products that can provide basic connectivity at a low cost. The key to success is a good management system so that there is not so much overhead compared to conventional desktop management.